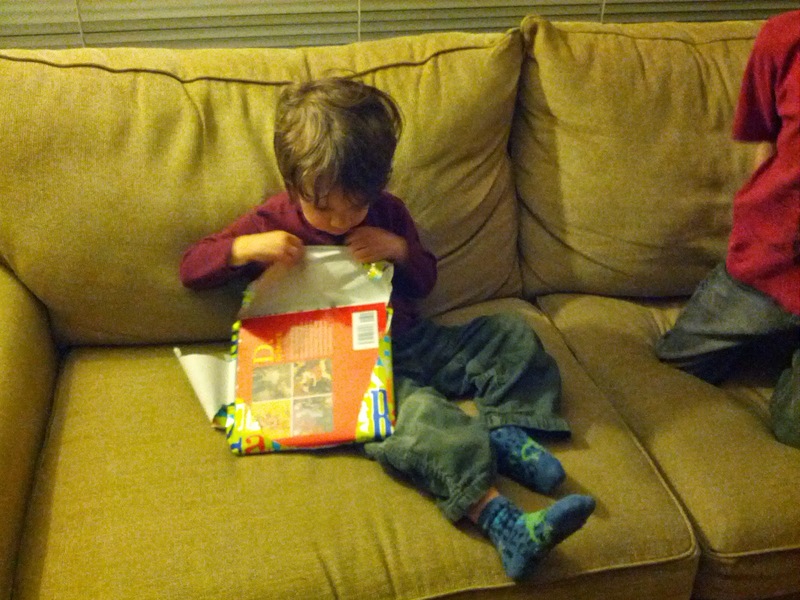 As cliche as it is to say, it really is hard to believe Malcolm is three already. We still call him "babes" or refer to him as a baby all the time. It's insane to think that he's old enough for Teacher Lauren's co-op class (I think my class schedule next year will actually work with co-op, so he's signed up!). He hasn't figured out how to climb out of the crib yet. We aren't terribly sad about this. He's very cautious (see above), unless you're talking about running into the street. While interested in all the playground equipment at parks, he refuses to try to climb anything, even with help. He just wants you to pick him up and place him at the top. I can't figure out if this is due more to fear of heights or laziness. He loves to recite things he's memorized. He's got a couple songs, a few books, and several minutes worth of dialogue from shows he likes to watch that he'll randomly pull out as he's playing. Loves dinosaurs and bikes and mushrooms. Some favorite books are Where the Wild Things Are, Caps For Sale, and any of his various dinosaur books. Insists on getting "kisses hugs" before I leave to go anywhere. Is starting to consistently correctly identify a few shapes and colors. I think he had a pretty good day. He got to go to his sitter's house in the morning while I met with a classmate to study for my OChem final. I let him pretend to drive the car for a few minutes after we got home and while he ate lunch he got to "watch pumpkin", which is a 20 minute Halloween movie on Netflix with pumpkins that come alive and try to eat everyone's candy. I tried to let him have a nap, but he stayed awake the whole hour plus that he was in the crib. 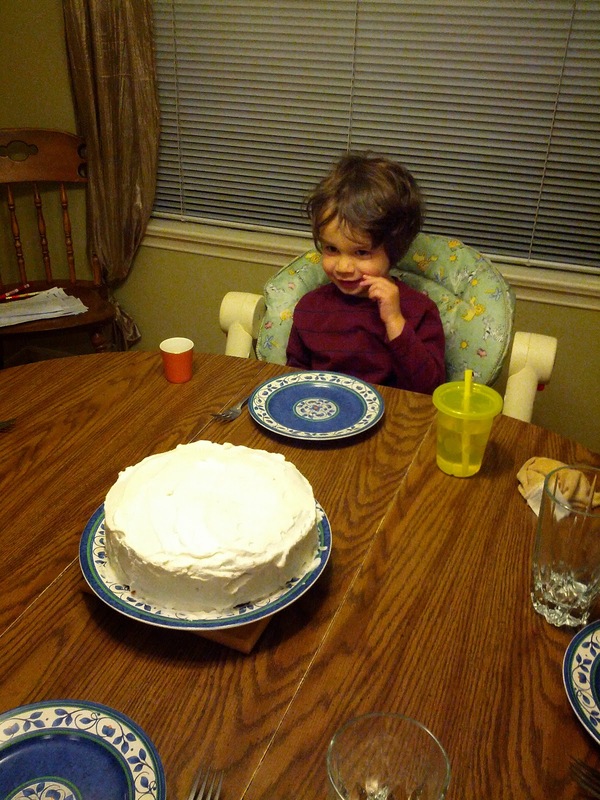 He seemed happy enough, though, and I needed to make his cake and study, so he got some nice quiet time. Then we picked up Gareth and headed to the toy store to let Gareth select a gift for Malcolm, so Malcolm got to play with toys there for an hour. While I tried to get dinner started the boys chatted with Gram. I finally got dinner done (beans and rice, roasted asparagus). 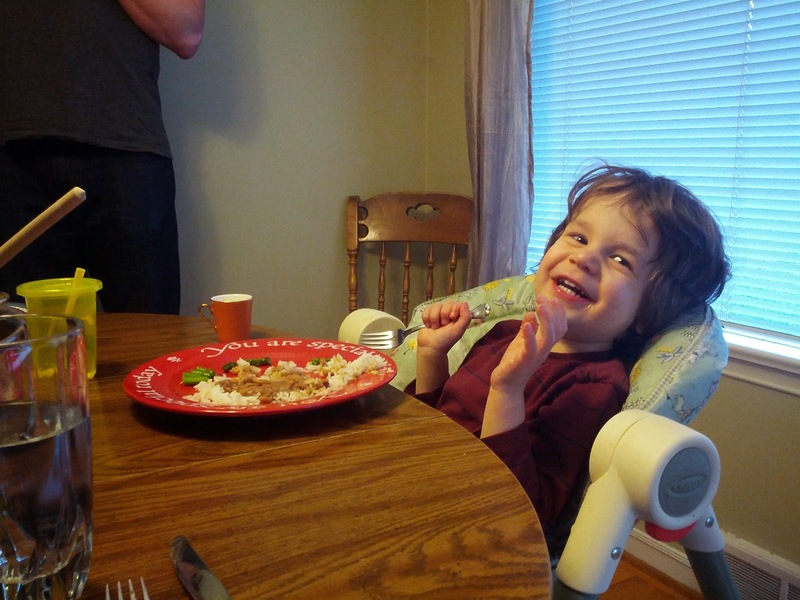 Malcolm rather liked having the special red plate. As Ryan was wrapping gifts and I was putting whipped cream on the cake, Grandma and Grandpa called, so we took some time to chat with them a bit. And "Auntie fanana"(Savannah) and Auntie Sabrina. We were already pushing past bedtime, so by the time we were done chatting Malcolm was quite tired. But he was happy enough to eat some cake and then open a couple of presents. We opted to save the others for the next day. 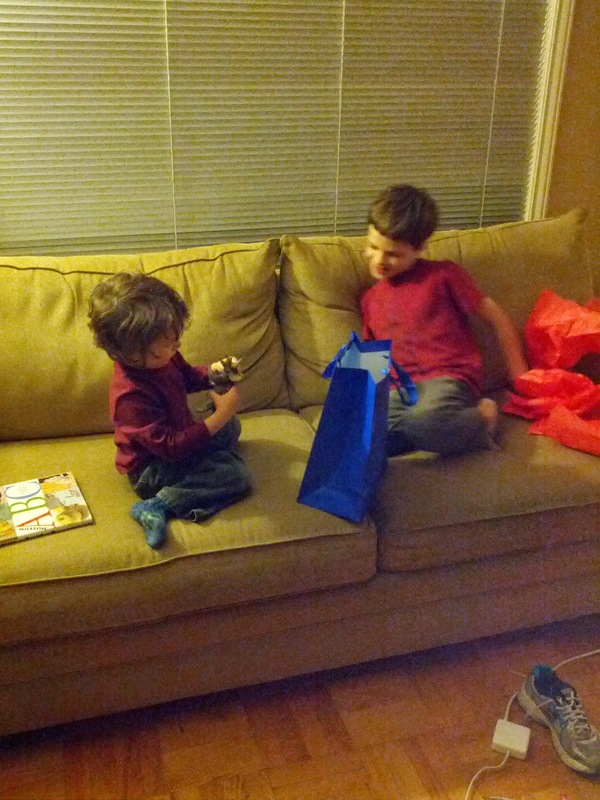 Gareth knows his brother well, and opted to get him another triceratops dinosaur. Malcolm loves it. I'm excited for the next year - I remember things starting to get a bit easier with Gareth when he was three, plus they're starting to learn really tangible things like letters and numbers, which I enjoy more. It was great to video chat with you! I'm so glad to see Malcolm using the red "special" plate! How fun! It's always hard to have our babies grow up, but it is also amazing to watch their progress. It's crazy how time flies! And what a docile little man you've got there. Now that it's warm enough to play, the kids have been out in the backyard with their friends a lot and I kept noticing that Benjamin was ending up on the high platform of the play set. This baffled me so I asked the girls how he was getting up there. They "didn't know." And I was like, "Yeah, sure, you don't."